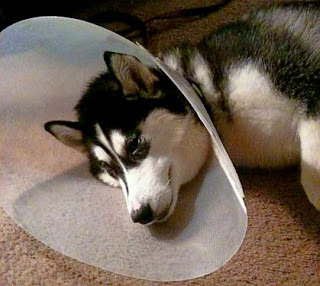 Nukka was spayed today. Her tooth was checked out, and the vet doesn't think it's a problem right now. 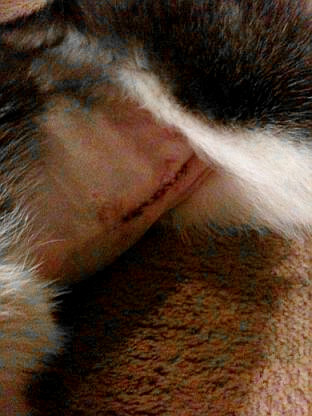 Along with the spay, the vet also took biopsies from four sections of Nukka's intestines. We will get the results in 4 to 7 days. The vet also put Nukka back on probiotics because her intestintes are an abnormal color. The total cost of Nukka's surgery today was $703.79. We are hoping that the biopsy will give us some answers about Nukka's health problems. That incision looks like it hurt, but Nukka is recovering now and we hope she'll be back to 100% very soon! Harnessed to Hope is a non-profit 501c3 organization. All donations are tax deductible. Hey, I love your blog, and I love your dog! I'm trying to get some info out that this dog is going to be racing again soon, should be so much fun. Can you help me out by mentioning it on your blog? Greetings! Unfortunately, some dog walkers discover a danger, only sadly, when victimized and so I wanted to inform you of StreetZaps. Just so you know, I confer with Con Edison's Stray Voltage and Public Affairs Units and contribute to Wet Nose Guide and New York Dog Chat. i liked the blog! and yes i am also equally hopeful that Nukka will recover more than soon. Hope Nukka is much better now. I really love this blog! Looks like Nukka is was on the mend, how has it adjusted, generally I see the dogs become more calm and are easier to train when spayed.